We’re in the midst of a renaissance. Call it the rebirth of the spinning top, a toy that’s been around since the dawn of toys themselves. Today, tops are being precision-machined in all shapes and sizes, with creatively crafted bearings, from a variety of interesting materials. And many of them spin as long as 8, 10, even 15 minutes. Pretty cool, right? Many seem not to get it. Inevitably, whenever a top is featured on Massdrop, the discussion section lights up with questions. Why do people buy these? Why are they so expensive? Can they be used for something other than spinning? To shed some light on the appeal of these divisive desk toys, we got in touch with 27-year-old Will Cutler. He’s the founder and lead designer of Vorso Spinning Tops, the UK-based manufacturer of the new Flat Top, available on Massdrop (dro.ps/vorso-flat-top). We started by asking him why he’s drawn to spinning tops, but we also dug deeper into how he conceives of his designs and what we can expect from Vorso in the future. What do you tell people who don't understand why someone would be interested in tops? If I'm in front of them, I’ll show them my Mk1. I carry the first off the line from the original Kickstarter batch. I explain the physics involved and the process of turning chunks of metal into performance-machined tops. It takes about 4 to 5 minutes to give them the spiel, and of course the Mk1 is still spinning by the time I finish. Do you carry a top with you most places? The pub, restaurants, friends' houses? If I’m going for a few drinks with friends, then I’ll take a top. It's a fun thing to play with while having a chat and a beer. They’re good conversation starters, too. We’ve heard from some in the EDC Community who wonder why anyone would carry a top every day. What do you say to those people? If someone is specifically into everyday carry or prepping, then I explain the real-world uses of a spinning top: a pendulum, plumb bob, level, trap weight, or even fishing sink. I've even heard of someone using a top in a self-defense situation as a makeshift knuck! That’s a new one! Why do you think most people collect tops? There are so many reasons! Personally, I spend a lot of time designing and working at a desk. I always have my Mk1 sitting next to me. I try to complete whatever task I’m working on before the top grinds to a halt. I think tops allow you to think through distraction. 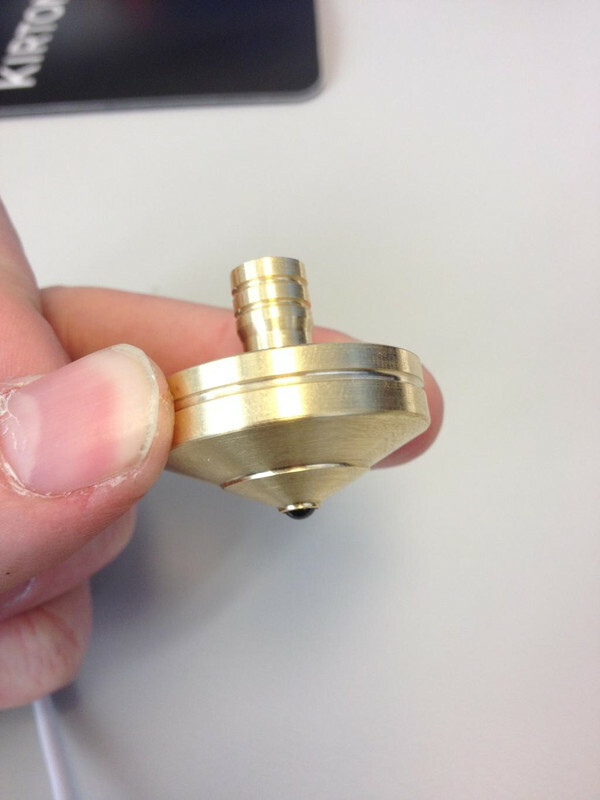 But a lot of collectors are into the machining and design of tops. There are some seriously talented makers out there who use all sorts of exotic materials and techniques, and each has their own style. What’s your style? Walk us through the production process. I work in five stages. I generally sketch ideas on paper, but only the details. I then move onto manually machining prototypes. Occasionally I’m happy with the first thing that comes off, a rare accident. If it happens, it's an amazing feeling, but usually it takes many, many prototypes to get things right. Once I’m happy and I’ve figured out the process to a particular design, I move onto the laptop and create 3D designs of my prototypes. The fourth stage is CNC machining. The Mk1, for example, is assembled from three highly precision components. Each piece is machined separately, which allows for much tighter control over the tolerances at work. It also means that each component can be checked for quality at various stages. Hand finishing, assembling, and a final cleaning are the last flourishes of the process. And then it’s time for the fun part, right? Where do you take it for a spin? Glass lenses, always. There are some fantastic surrounds available, too. Check out ItsClearCut [on Etsy] for a great surface. We’ve also just launched our first spin stations, which will be on Massdrop soon. They are machined aluminium with either 75-millimeter or 100-millimeter lenses. They look absolutely wicked on desks and coffee tables. Cool! Any other projects we can look forward to? The Mk1 is now available for the first time in stainless steel and copper—both beautiful materials with totally different characteristics, weights, and strengths. It's something a lot of our customers have asked for and I'm excited to announce their arrival. There has even been talk of a tungsten Mk1, but we’ll have to wait and see if the rumors are true. We’ve also just launched our first gyroscopic hand spinner [available on Massdrop at dro.ps/vorso-flat-top]. The Flat Top is an awesome little fiddle toy, combining the unique characteristics found in a gyroscope with a spinning top. It can be spun on a table or held in the hand. I’m also working on our first limited-batch run of Mk1 Specials. It's going to be named The Ray Cutler Special, in honor of my late grandfather. His passion was building cars—Bentley, Daimler, Austin, Land Rover, Ford. He worked, designed, and perfected them all. He was also a keen driver, competing in hundreds of races in the UK and around Europe, and winning a lot of them. He taught me the joy of making things with your hands and mind, the love of engine oil, speed, and near death. The design of the top takes features from some of the cars I loved in his collection. I make them by hand on an old Craftsman lathe from the 50s. Super classy, love it. Great work! 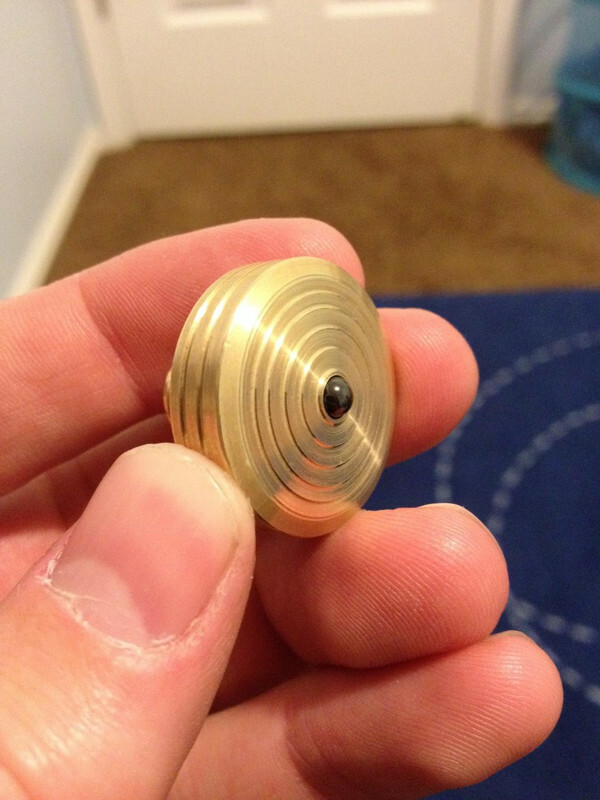 Check out the ispin on indegogo for a low cost brass spinner. Is there any chance of making an Irish claddàugh ring design with an emerald? This spinner is a work of art, having great fun! What size bearing is this 8x22x7 ? After such a long wait, I will say that I love the new Vorso Top. After a few test runs I actually got a thirteen minute spin out of it the first night I had it. The fit and finish are superb and will defiantly get another one if the setup another drop. What are these for? Just curious. Is the thrill from the balance and spinning or is it for thinking and brainstorming. I don't fully understand the appeal myself. It's basically just finger-tops, so there is no real tricks you can do with them like you can with a regular spin-top that you throw with a string. Just spin and wait watch. I even wonder about the geographical breakdown of sales. Do they sell better in Colorado, California, and Oregon? Something to do after you smoked one and the pizza isn't quite ready? More seriously, I can't criticize too much as I have my share of trophies and prizes from minor yo-yo and spin-top contests from earlier in my life. You can spend too much on yo-yos seeking better performance (and I have), but that is in the quest to be able to do more tricks. I even know one of the customers where I service office equipment has a sizeable collection of finger tops, but mostly of the wood and plastic variety. I have not seen any of these brass/bronze/aluminium tops on his desk. I have offered to teach him how to throw a real spin-top sometime. I have a first generation MK1 Vorso top and it hardly gets spun. It has no knurling on the stem and makes it almost impossible to spin. All other tops, including the newer model Vorso tops have knurling that make spinning easier. With the knurling, I'm sure this is a wonderful top. Interesting for sure. Was wondering what the hell was up with these things for a while now haha. He hasn't set prices yet but he had mentioned maybe the spinner with a bearing would be $40. Then you could add arms to it that would be somewhere around $20. With this modular approach you can get as expensive as you want or as cheap. The 3D printed ones, while cool tend to break easily. I know in his videos, he's broken a few relatively easy. Very interesting. The flat spinner is just too expensive for me. I have one of his tops. It really is great. The Vorso Flat Top EDC Spinner just went live!